Emma Fisk is a deep-rooted jazz violinist. Here, from her website, is the story of how she became one. I first encountered Emma at the Whitley Bay Classic Jazz Party, where in the past three years she has been called upon to honor Eddie South, Stuff Smith, Stephane Grappelly, Joe Venuti, and others — see her in action here and here. (Emma pops up here and there on my most recent videos from the Mike Durham Classic Jazz Party, and she’s always welcome.) Then I heard the CD, featuring Emma, as part of the splendid small group aptly calling itself DJANGOLOGIE. Fast forward to November 6, 2015, where Emma was leading a stellar quartet that she whimsically called “the Hot Club of Whitley Bay,” herself on violin, Martin Wheatley, Spats Langham, guitar; Henry Lemaire, string bass. Here are the delights they offered us. Follow Emma (as we say in this century) on Facebook, where she is Emma Fisk Jazz Violin. The very expressive swinging violinist Emma Fisk was given a difficult assignment — to summon up the ghosts of Stuff Smith (violently, dramatically hot) and Eddie South (elegance personified) in thirty minutes at the 2013 Whitley Bay Classic Jazz Party. I’d give her and her colleagues very high marks at this nearly-impossible task. The colleagues are Jeff Barnhart, piano and vocal (hear him romp on the verse to LADY BE GOOD — a feat that astonishes the band — as well as on a block-chord solo on SKIP IT), the ceaselessly rocking Richard Pite, drums; the energized Henri Lemaire, string bass; the versatile Spats Langham (called upon to be Django for seven choruses of uplifting accompaniment on EDDIE’S BLUES), and two guest stars to take us close to the Onyx Club Boys of fabled memory, Ben Cummings, trumpet (hidden behind someone’s coif, but he comes through clear as a bell); Jean-Francois Bonnel, clarinet. Here they are — recorded on November 3, 2013, nimbly being themselves while honoring departed masters. Well played, Emma, Jeff, Spats, Henri, Richard, Ben, and Jean-Francois! And I know that Emma has a feature set at this year’s Whitley Bay Classic Jazz Party called FIDDLESTICKS in honor of Signor Venuti, which I know will be fun. Ask any jazz scholar to name another early innovator in jazz electric guitar in addition to Charlie Christian. A few scholarly types will remember Eddie Durham, Leonard Ware, Floyd Smith, Les Paul. Someone will think of Allan Reuss’s PICKIN’ FOR PATSY. But few will think of George Barnes. That’s a pity, because Barnes was exploring the instrument’s possibilities in the late Thirties. Proof of just how inventive he was — at 19! — has recently been offered by the George Barnes Legacy Foundation: a series of delightful home recordings of Barnes and friends in mid-1941. On these tracks, Barnes improvises masterfully not only on electric guitar but also piano, and he’s aided by Bill Huntington and Bill Iverson, rhythm guitar; Ralph Hancock, cello; Jerry Marlowe, piano; Bill Moore, string bass; Benny Gill, violin; Adrienne Barnes, vocal. 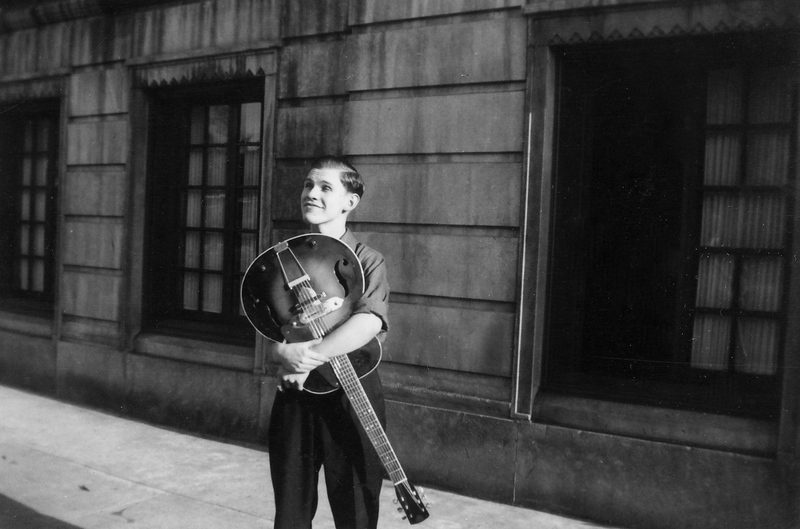 In the spring of 1941, 19-year-old guitarist George Barnes had already been a national radio star for almost two years, and enjoyed jamming with his colleagues after they’d wrapped their respective NBC shows. In March, June, and September of 1941, George’s friends — including violinist Benny Gill, rhythm guitarist Bill Huntington, and bassist Bill Moore — dropped by his Chicago apartment in The Chelsea Hotel and played into the wee hours. These 15 tracks were recorded directly to acetate discs by recordist Joe Campbell, who had been a Barnes fan since the first time he heard 17-year-old George play at Gus Williams’ Nameless Cafe on Chicago’s West Side. The fifteen selections are BARNES’ BLUES / BARNES’ BOOGIE WOOGIE / BODY AND SOUL / JA-DA / MEMORIES OF YOU / NIGHTFALL (four versions) / SUNNY SIDE OF THE STREET / SHE’S FUNNY THAT WAY (two versions) / SOMETHING TO REMEMBER YOU BY / SWEET LORRAINE / TEXAS BLUES. And for those who shy away from “old private recordings,” these sound good for their age. The originals have been well-mastered, and they were originally 12″ acetates, which afforded longer playing time. Barnes’ colleagues, although their names are not well-known today, are rewarding players who hold our attention throughout. Violinist Gill plays beautifully on BODY AND SOUL, MEMORIES OF YOU, SUNNY SIDE, SOMETHING TO REMEMBER YOU BY — in an Eddie South mood; Adrienne Barnes (George’s first wife) reminds me beautifully of Ella Logan and Maxine Sullivan, and the supporting players are first-rate. In addition, the collection offers two rare October 1941 electric guitar duets by Barnes and Ernie Varner, G MINOR SPIN and SWOON OF A GOON, as well as a brief audio reminiscence by recordist Campbell. And here, a little reiteration is necessary. Barnes was 19. What does it all sound like? Since George’s first instrument was the piano, it’s fitting that the set begins with a violent but precise boogie-woogie that sounds as if Albert Ammons had been studying the Romantic tradition (Rachmaninoff, not love ballads); the guitar blues that follows is delightful, a subtle mixture of harmonically deep chordal playing and sharp single-line inventions, a JA-DA that alternates between musing interludes and straight-ahead swing. MEMORIES OF YOU has touches of Louis and of what we would come to call “American roots music,” and is the work of a compelling melodist, someone with his own sound on guitar, someone more than able to make electricity work for him. When he is backing Adrienne Barnes on NIGHTFALL (the first version), his accompaniment is a beautiful orchestral tapestry, moving the melody along while creating a rich hamonic background. The three versions that follow — solo, duo, and trio — are also lessons in what can be done, so evocatively, with lyrical material. The solo piano SHE’S FUNNY THAT WAY is also a pleasure, combining an endearing simplicity with harmonic experimentation (think of, say, Nat Jaffe two and three years later) and an audible sense of humor: had Barnes chosen piano as his instrument, he would be known in jazz histories. SOMETHING TO REMEMBER YOU BY, which begins with extravagantly rhapsodic piano, shifts into fourth gear when Barnes begins his guitar solo. SWEET LORRAINE has a melody statement worthy of Eldridge in its contained force; the closing TEXAS BLUES is rocking from the start, merging Western swing and the hot jazz of the time. The Barnes-Varner duets that close the set are intricate, twining duets — compositionally rich, the sort of playing Barnes and Carl Kress, Barnes and Bucky Pizzarelli did later on. It might be hard for some to hear how radical Barnes was in 1941, but that’s tribute to his mastery, for all of his style has been subliminally integrated into the mainstream of jazz guitar playing: the pistol-shot single notes, the audacious harmonies, the singular way of constructing a solo — in these solo guitar performances, he has the mastery of Django or Lang, weaving even the most simple material (JA-DA) into a concerto with shifts of mood and tempo. This set — which I hope is the first of many — has been produced by George’s daughter, Alexandra Barnes Leh, who hopes to make more people aware of her father’s swinging, innovative playing. For more information on how to order this set — available only as a digital download — click here. There, you can learn more about what the Legacy Project — how you can purchase instructional materials (audio and print) created by Barnes for beginners and for advanced students — and more. Posted in "Thanks A Million", Generosities, Irreplaceable, It's All True, Jazz Titans, Pay Attention!, Swing You Cats!, That Was Fun!, The Heroes Among Us, The Real Thing, The Things We Love, Wow!